This morning, Hockey Canada announced its final 23-player roster for the 2018 Olympics. The Canadian women’s team includes three Manitoba natives. Since being centralized back in May, the women’s national team has competed in several pre-Olympic games and tournaments, most recently a series of six matches against the United States. 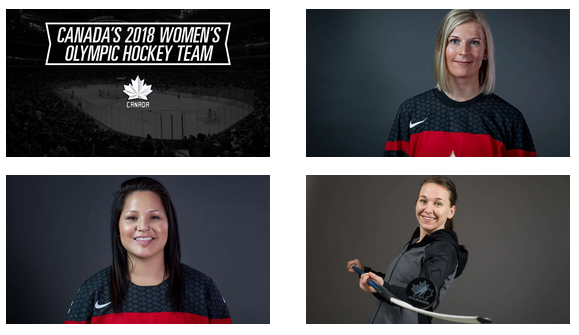 Four Manitoban women were named to the centralized 28-player roster and have been fighting for their chance to help Canada’s women’s national team in their quest for Olympic gold in 2018. All hailing from small towns, Bailey Bram, Brigette Lacquette and Jocelyne Larocque are the first Manitobans to book their tickets to February’s Olympic Games. 22-year old defenceman Halli Krzyzaniak of Neepawa, Man., was also named to the centralized roster but will not be joining Canada’s Olympic team this time around. In the last decade, a strong American team has been victorious in the majority of their match-ups against Canada, but Canada’s women have had the upper hand in 2017. Despite having won just two of the last ten World Championships, the Canadian team has looked unstoppable on the Olympic stage over the years, and are looking to clinch their fifth consecutive Olympic title in PyeongChang. Defending Olympic gold medallist Jocelyne Larocque will be joined in PyeongChang by first-time Olympians Bailey Bram and Brigette Lacquette. Assistant coach Dwayne Gylywoychuk of Winnipeg will also be representing Team Canada at the Games as part of the women’s hockey team. Jocelyne Larocque is a defenceman from Ste. Anne, MB. Jocelyne was the first female player to play in the Winnipeg High School Boys League, and has been playing with the Canadian National Team since 2009. 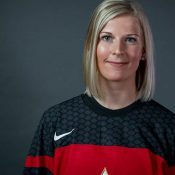 Larocque has six World Championship medals with Canada, as well as an Olympic gold medal from the 2014 Sochi Olympic Games. The Brampton Thunder captain is likely to be one of Canada’s top blue-liners in PyeongChang. 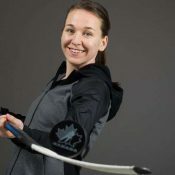 Joining Larocque in February are two fellow Manitobans, both of whom will be playing in their first ever Olympic Games. Also from Ste. Anne, MB. is forward Bailey Bram. Formerly playing for the Mercyhurst Lakers with younger sister Shelby, Bailey Bram has played for Team Canada at each of the last five Senior World Championships. Bailey was one of the national team’s last three payers cut leading up to the Sochi Olympic Games in 2014, where Canada struck gold. Currently, Bram is an assistant captain with a star-studded Calgary Inferno team. Though PyeongChang will be her first Olympic Games, Bram is a five-year veteran with Canada’s Senior National Team and has speed and a scoring touch that will undoubtedly help Canada on its quest for gold in PyeongChang. Also with Bram on the Calgary Inferno is defenceman Brigette Lacquette. Brigette made her senior national team debut with Canada in 2015 and has won medals with Canada at the 2015 and 2016 World Championships. 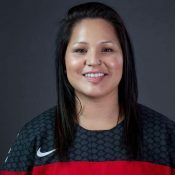 25-year-old Lacquette is from Mallard, and is the first indigenous woman to play for Canada’s women’s national hockey team. Formerly playing with the University of Minnesota – Duluth, Brigette has been working to find herself a permanent spot on the senior national team for nearly four years. Brigette has made space for herself on Canada’s Olympic team, and will join her two Manitoban teammates at her first Olympic Games in February.